Wow...that's amazing! This has so much detail and dimension and the colors are wonderful, just perfect for fall. I really love it the way it is and I think it would be lovely on a dining room table (yours or your daughters)! He is fabulous, beautiful autumn colours, your Daughter will love it. I like your turkey centerpiece decoration it looks wonderful! wow so terrific I am going to check out that svg. Great papers sure to make your Thanksgiving table shine. Like the Turkey decor. Especially like the flecked out (not sure if this is proper way to describe or word it) on the brown cardstock. Wow! You did a great job! Love the colors! You are on a Crafty Roll!!!!!LOL...Awesome! !I love it!Its really pretty!I would use it! This is super duper duper.Love how you have made the feathers stand out..Amazing creativity!! I think this is adorable!!!! Love the turkey's wings! 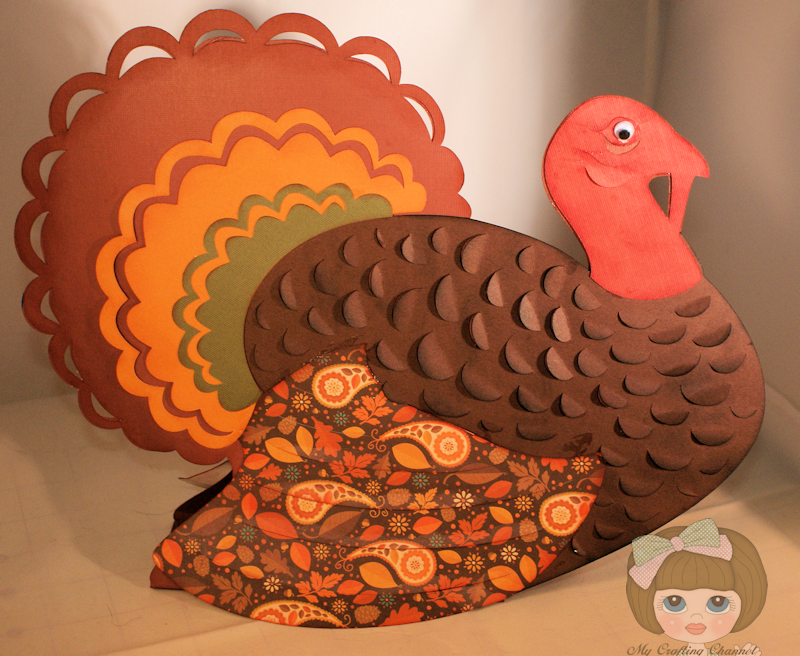 Great paper turkey! Loving the little turkey wings! What do you mean you're not crazy about it? We all love it and are now jealous of how great her table will look! You are setting the bar real high with your designs this week and they are a delight to look at! Thanks for sharing with us each day! Sorry you're not satisfied with it but I think it's super cute! WOW! you are so talented!!! Thank you for joining ups over at Decorate to Celebrate. TFS and have a fantastic Day!! Stopping by from DTC and WOW! I love this turkey!